The British luxury car brand has teamed up with Hogan. 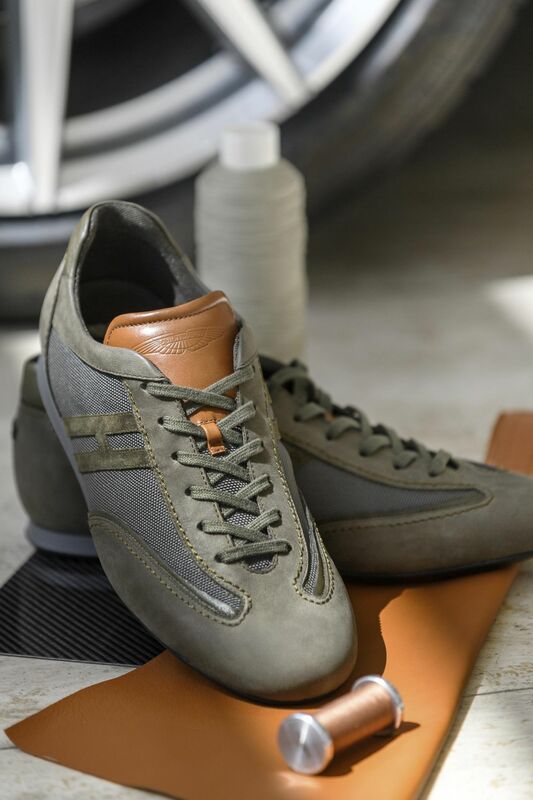 British luxury GT and supercar company Aston Martin is partnering with Italian footwear brand Hogan on a range of limited edition sneakers. The ‘Aston Martin x Hogan' sneaker will be available for order at the end of June and when it does arrive, will do so in what the companies describe as four "striking" color ways that will be representative of Autumn/Winter 2017. Formed from leather but covered in a nylon mesh for extra rigidity without restricting movement, the sneaker follows the form of Hogan's existing Olympia design but with some notable differences. Chief among them is the addition of a kestrel tan leather tongue, cut from the same hides Aston uses to dress its vehicle interiors and featuring the same pinched seam found on its seats and door panels plus an embossed Aston Martin ‘wings' emblem. Although Aston has been actively looking for ways of extending its brand and of offering clients products and services that complement their lifestyle, until now, the company's forays into fashion and accessories have been limited. It offers a range of premium leather luggage, of cashmere socks and of motor racing-inspired clothing. And, of course, like all storied automotive marques with a racing pedigree, it has an ongoing partnership with leading watchmakers who once upon a time would have manufactured the car's gauges and dials, but who now make elegant timepieces built using the same materials and taking the same design cues as the cars themselves. However, the marque wants to be seen as a true luxury brand and that increasingly means forging partnerships with brands perceived as its contemporaries in other areas of fashion and lifestyle. "Collaborating with brands that share our views on quality, style and elegance is important to us," said Marek Reichman, EVP & Chief Creative Officer at Aston Martin. Looking beyond the automotive industry is also crucial if Aston's designers and technicians really want to create products that chime with the super rich. It's why for instance, when Rolls-Royce's designers visit Paris, they make a point of meeting with the likes of Hermes and Louis Vuitton to understand the latest techniques in leather work or fabric treatments. And this is clearly a way of working that Aston intends to ape. This will represent the third major partnership following agreements with Hackett and Richard Mille. "Working with creative teams outside of the automotive industry helps to broaden our designers' minds," said Reichman. "We take inspiration from all walks of life and our work with Hogan will help to shape and inspire many aspects of our future creations." The ‘Aston Martin x Hogan' sneaker will be limited to 3,000 pairs.